Do you have a dog that pulls you down the sidewalk and never looks back? A GENTLE LEADER (GL) is a good tool to have. It's described as "Power Steering for Dogs". The GL is often confused as being a type of muzzle because there is a strap that wraps around the back of the dog's snout. The function of the strap directs the dog's nose down when he/she pulls on the leash, which in return causes the dog to return some slack in the leash in order to look forward. The dog can still drink and even eat with the GL on. The GL is simply used as a walking device and should not be left on the dog unsupervised and it should be removed after walks. From a Trainer standpoint, this is a golden piece of equipment that should be as common as a leash and collar for most dogs. I've seen dramatic differences in dogs that are normally reactive on leash, but with the GL the dog can be refocused by the owner in half the time. This also increases reward opportunities, because your dog is more likely to stick next to you rather than pull on the leash. Desensitization needs to be done before using the GL. I often hear owners tell me they tried the GL and the dog didn't like it so they stopped using it. This happens when no desensitization has been done. The GL was most likely put on the dog's face and then expected to work immediately. With any good thing, there's a little bit of work that needs to happen first before hooking on the leash. I highly recommend this product for persistent pullers of all sizes. They are available in all sizes and even come with a Training Guide and DVD! Get your dog use to having the GL loop around his nose by placing the loop over his nose and rewarding with a treat. Once he's almost done with the treat, take the loop off of his nose. Do this quickly about 10 times so your dog has no time to think, "I don't like this on my nose". Do not clip the strap behind his ears yet, simply reward your dog for having the loop over his nose and getting use to the feeling. Once your dog starts to welcome the loop coming over his snout, you can then clip the strap behind his ears quickly and then feed him for 1 minute straight. Don't give your dog time to fuss with this new thing on his face. Feed him treats and when you have fed him for about a minute, allow him to finish his last treat and right before he does, take the entire GL off quickly. Repeat this 2 times a day for 3 days. Once your dog welcomes the GL being on his face, because it's now associated with great things, we can attach the leash. 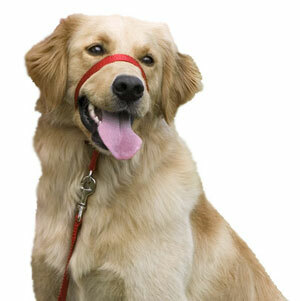 Be aware that your dog will fuss with the GL once you attach the leash and begin walking. Stay calm, wait until your dog stops pawing or fussing with it and once he stops, reward. Reward your dog for walking nicely with the GL on for the next few days and then you should be able to phase out food completely. Before setting off on your walk with your dog decide what you will reward your dog for and what you will not. For example, if you start off your walk and your dog is there by your side, make a choice to reward that and continue to reward that throughout the walk whenever your dog is in the heel position. If your dog pulls, one thing you can do is turn around and wait until your dog is by your side again and offer praise once he/she arrives there in the heel position. Remember that nagging your dog or yanking on the leash doesn't convey much information for your dog, so think positive and find those reward opportunities...your dog will thank you for it!